Like Silk on the hoof! You can buy white alpacas and color them any color you want or raise colored alpacas and get natural colors that dye will never achieve. With suri alpacas you get the added bonus of the soft under glow that the suri fiber gives. 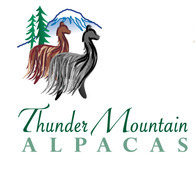 Thunder Mountain Alpacas is raising suri alpacas with fine fiber with high luster. Once you put your hands on a suri fleece, you know why we do what we do. Our goal is to provide the fashion industry with the finest North American suri fiber to be made into exquisite high fashion products. 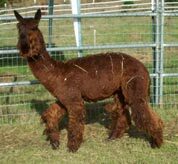 As of now we have some very fine suri alpacas for sale. These are very fine animals with great fiber. We are now looking at getting out of the alpaca business. Even though alpacas are easy to care for, health problems and age is making it difficult for us to continue looking after our herd. We have our entire herd for sale and all of the alpacas are available to purchase individually. We are also offering some great packages at greatly reduced prices to assist getting these fine animals to great new homes. 10% transportation credit if alpaca is moved outside of the Pacific Northwest. Will negotiate all terms of sale. Half price sale on all alpacas (except groups)!! Pick out your favorite or make a group. Call (360) 666-4553 with any questions. Transportation and ajisting costs are very flexible. Help us get these fine animals to a new home!